Midnight Update: An additional 0.02" this evening brings the monthly total to 5.86". With only a minimal chance of a passing shower through the rest of today, this June will go into the record books with precipitation slightly under 200% of average in Washington, DC. 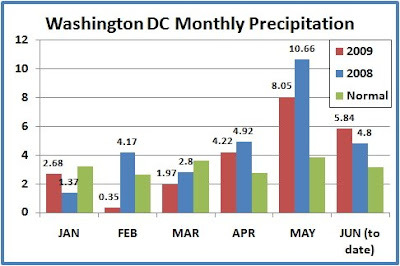 Far from setting any records, however, the official Washington National observation of 5.84" is not enough to put this month in the top 20 wettest Junes. Monthly precipitation for June has reached double digits 3 times in history; this is exceeded only by the 5 Septembers which have seen more than 10". The most recent occurrence was only 3 years ago, when the June monthly record of 14.41" was set. 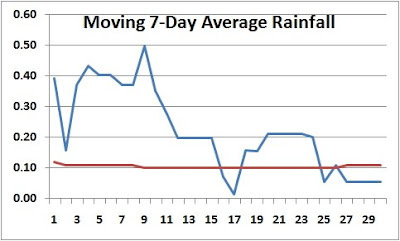 In a carryover from May's heavy precipitation, the first 10 days of June were the wettest on average, as shown by the chart of the 7-day moving average above (normal daily amounts are shown by the red line). By the middle of the month, only 0.08" of rain fell in the week ending on the 17th. Average daily amounts picked up somewhat from there, but the month ended with only about half the normal daily amount. Although widespread areas in northern Virginia through central Maryland and the vicinity of Baltimore have had over 150% of their June rainfall, parts of western Virginia and especially the state of West Virginia have seen substantial shortfalls of precipitation for the month. BERGSTROM TODAY. THIS BREAKS THE OLD RECORD OF 102 SET IN 1956. TODAY. THIS BREAKS THE OLD RECORD OF 102 SET IN 1980. A RECORD HIGH TEMPERATURE OF 106 DEGREES WAS SET AT AUSTIN CAMP MABRY TODAY. THIS BREAKS THE OLD RECORD OF 102 SET IN 1956. A RECORD HIGH TEMPERATURE OF 100 DEGREES WAS SET AT BEAUMONT PORT ARTHUR TODAY. THIS BREAKS THE OLD RECORD OF 96 SET IN 1969. REGIONAL AIRPORT TODAY. THE RECORD WAS SET IN 1937. A RECORD HIGH TEMPERATURE OF 101 DEGREES WAS SET AT VICTORIA YESTERDAY. THIS TIES THE OLD RECORD OF 101 SET IN 1953. THIS BREAKS THE OLD RECORD OF 97 SET IN 2005. A RECORD HIGH TEMPERATURE OF 101 DEGREES WAS SET AT LAFAYETTE TODAY. THIS BREAKS THE OLD RECORD OF 100 SET IN 1930. IN A ROW FROM JUNE 12 TO 16 AND AGAIN FROM JUNE 24 TO 28 IN 2009. AT AUSTIN...DEL RIO...AND SAN ANTONIO IS LISTED BELOW. EIGHT AND THIS OCCURRED BETWEEN JUNE 13 1996 AND JUNE 20 1996. IN 1925. THERE WERE 11 100 DEGREE DAYS BACK JUNE OF 1998 AND 1948. THE ENTIRE MONTH OF JUNE...WHICH WAS SET ON JUNE 24TH 2009. TEMPERATURE FOR THE DAY. THE PREVIOUS RECORD HIGH MIN WAS IN 1999. FALL BELOW 80 DEGREES (PREVIOUS RECORD 1999). AIRPORT. THIS TIES THE OLD RECORD OF 101 SET IN 1980. BREAKS THE PREVIOUS RECORD HIGH TEMPERATURE OF 99 DEGREES SET IN 1980.